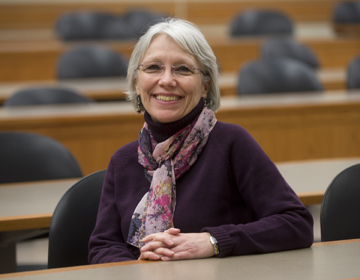 When Carol Horan looks at a classroom, she doesn't see just a learning space -- she sees a space where class sections will help students make progress toward their degrees. The associate registrar for academic and classroom scheduling, Horan ensures that the University uses each of its 275 classrooms in the most appropriate ways possible. She also ensures that each space provides its maximum educational potential. How do you determine the classroom space used each semester? First of all, we -- meaning my five staff members and I -- typically build each semester's classroom schedule well in advance. For example, we just finished the schedule for fall 2013, and we'll start on spring 2013's schedule in late August. We'll use the downtime to maintain this semester's schedule and the schedule for next fall, making the last-minute changes or adjustments that are necessary. When we start building a schedule, we go to each academic department's scheduling deputies first. There are about 70 deputies total, and they really are vital to our process. Once they provide us with a list of the large, lecture-style class sections they'll have that semester, we schedule those sections first, particularly because large learning spaces are scarce. Once we have the large lectures scheduled, we divide up the remaining rooms by department -- each one gets a certain number of rooms and lab spaces, and so we schedule the needed rooms based on what's available. We then publish the finished schedule online, including class times and locations. At that point, students can sign up for classes. It takes about a month and a half to finish the initial scheduling process. Does a schedule ever change once you've finished it? Yes -- we like to joke that a schedule is always out of date by the time we publish it. There are a lot of things that require us to adjust a published schedule, including courses that are added at the last minute, additional course sections and courses that are canceled. We keep track everything digitally in a program called UniTime, so when those changes occur, we can make them and publish them fairly easily. What are some challenges to putting together an academic schedule? There are a lot of factors we have to take into account when searching for the right room for any given class. For example, with the University's IMPACT (Instruction Matters: Purdue Academic Course Transformation) course-redesign initiative in full swing, many foundational classes now require specific classrooms that have been turned into active learning spaces. Making sure those spaces -- which are limited but soon will become greater in number -- are available for these redesigned courses is always important. As more classes are redesigned through IMPACT, I anticipate this will continue to be a priority. We're also seeing a lot of sections become larger, meaning more students can take them, and so it's always a challenge trying to find those bigger spaces. In general, as departments' needs become more specific -- whether it's for IMPACT learning spaces, larger spaces or both -- we're always being creative to make everything work. What changes have happened in the academic scheduling process during your time at Purdue? I've been here at Purdue for 40 years, and I've been involved in academic scheduling in some way the whole time. Back when I first started, we compiled the schedules by hand, with our staff keying in all the departments' requests. As you might imagine, that system was fraught with opportunities for errors, so I think the electronic way we do things now is far easier. Although a lot has changed in 40 years, one thing that hasn't is our philosophy, and it's this: We're here to help students. Our job is to ensure that all the courses they need to make meaningful progress toward their degrees are available in the right spaces, and so everything we do is with that in mind. If there's anything we can do to help students' move through their education efficiently, we want to do it.